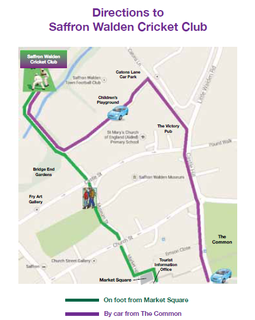 Whether you are coming to Saffron Walden to play in a match or to watch one, here is some information you may find helpful. From Thaxted Road go straight over the East Street traffic lights, up the side of the common. At the T junction, turn left and follow the road to a mini-roundabout. Turn right and follow the road, turning left again just after the Victory pub. Follow the road down to the Catons Lane football club car park and then turn left through the car park following the track to the cricket club. From Newport follow the main road into the town, down the high street to the traffic lights at the bottom. Turn right and follow the one way system until you come to a mini-roundabout. Turn left and follow the road with the common on your right hand side. Turn left just after the Victory pub. Follow the road down to the Catons Lane football club car park and then turn left through the car park following the track to the cricket club. From the North on the B184 (Windmill Hill) take the first turning on the left after the Eight Bells pub. This will take you into Castle Street (note 20mph limit). At the end of the street, turn left onto Little Walden Road, and then quickly left just after the Victory pub. Follow the road down to the Catons Lane football club car park and then turn left through the car park following the track to the cricket club. There are three footpaths which lead to the ground apart from the road route described above. There is a path into Bridge End Gardens just to the North of the Eight Bells pub. Follow this path into the gardens, walk through them, and near the entrance to the maze there is a gate which brings you out near the Anglo-American war memorial. Just past the memorial you will see the grounds. There are also two paths from Castle Street, one opposite the Catholic church which leads past the Fry Art Gallery into Bridge End Gardens, and so to the cricket ground. The other is opposite Museum Street, and leads more directly to the cricket ground (as shown in the map). Swan Meadow Car Park (large long stay car park). From the car park, instead of following the signs into town via Park Lane, turn left past the duckpond into the bottom of Freshwell Street. At the far end of Freshwell Street, cross Bridge Street and turn left. Just past the car park of the Eight Bells public house, a footpath leads to Bridge End Gardens. Walk through the gardens (admiring the view on the way) to the Cricket Ground. The Common Car Park (smaller car park, nearer the centre of town): this is on Common Hill. More about car parking HERE. The Eight Bells: the nearest pub to the Club's main ground, Anglo American Playing Fields, it includes a restaurant and bar meals, and it welcomes families: http://8bells-pub.co.uk/ It is a very short walk from the pub to the cricket ground, through Bridge End Gardens (see below). There is a garden at the back which is open in the summer. Saffron Walden Museum: The town has a fascinating museum, open since 1835 http://saffronwaldenmuseum.swmuseumsoc.org.uk/ . Inside the grounds are the remains of a castle dating back to 1141. Saffron Walden Market and Shops: The market is held in the centre of the town on Tuesdays and Saturdays http://www.visitsaffronwalden.gov.uk/about-us.htm . We also have a large range of independent shops.